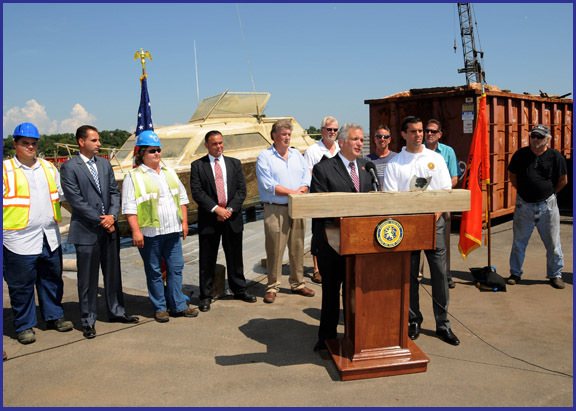 Legislator Michael Venditto, Nassau County Executive Edward P. Mangano, and New York State Department of Environmental Conservation Regional Director Peter Scully today announced the success of south shore waterway and marsh bank cleanup efforts performed by VIP Splash Waterways Recovery Group over the past four months. Through the use of side scan sonar technology and dive teams, the organization has identified and removed 1,624 tons of debris, including more than 75 boats as well as household and commercial debris left behind by Superstorm Sandy. Debris is handpicked from salt marshes and shoreline areas from the Atlantic Beach Bridge to Massapequa Shores and then loaded onto barges. Debris then arrives at one of three offloading sites throughout Nassau County. To date, thousands of cubic yards of debris have been removed and properly disposed of at transfer stations approved by the New York State Department of Environmental Conservation (DEC). Removal of debris is important as high tide carries debris caught on the marsh banks into local channels. Much of that wreckage will remain floating near the surface, almost invisible to a boater until it is too late.